Having a party or hosting an event and you already have the 'source', but need a easy to set up, great sounding PA for hire? This Speaker Hire option allows you to plug and play from a DJ mixer or audio console and will be suitable for events with up to 150 people. 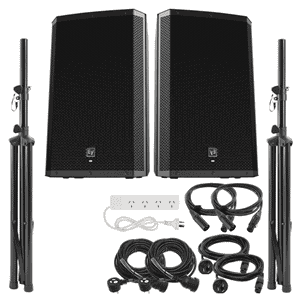 When you hire this PA, you'll get a combination of great quality sound, all in a compact, easy to set up package that can easily fit in the back of a standard sedan.